Cardillo says NGA is seeing a surge in hiring in the scientific field and in the creation of new relationships with industry. WASHINGTON — National Geospatial-Intelligence Agency Director Robert Cardillo on Thursday will transfer the reins of power to the agency’s new director, Navy Vice Adm. Robert Sharp. 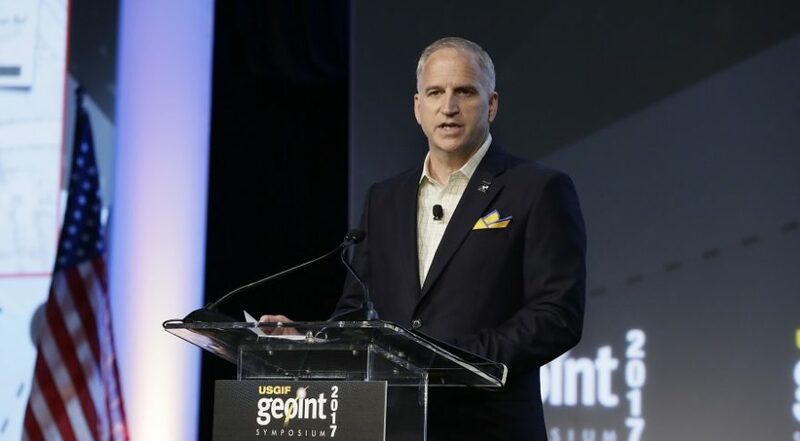 In an interview with SpaceNews, Cardillo reflected on his more than four years at the helm of NGA, an agency of approximately 14,500 employees that is responsible for analyzing satellite imagery and turning it into useful data for military commanders and policy makers. What is happening at NGA in the midst of so much change in the geospatial intelligence industry? There is a huge focus on industry partnerships. I want us to be close to incubators. The agency is not hiring more analysts but as people retire, we are shifting government positions to science-based disciplines. We need data scientists to help us engage with the ecosystem of technology startups and universities. For example, we just signed an agreement with Missouri Technology Corporation. MTC is a public-private partnership to promote entrepreneurship in high-tech industries. MTC will help us make those connections. A revolution has erupted in artificial intelligence, small satellites and space data collection. How has NGA adapted? There is a perception that if you have AI, you don’t need humans anymore. That is completely erroneous. Not only do I need scientists to help with analytics but I need humans to turn analytics into value for customers. That’s still a human based operation. We still have to have high-end analysts to make the more important strategic judgments of what all the data means. A key move was to hire Andy Brooks as our chief data scientist. We got him from the University of California at Berkeley and we agreed to let him work from San Francisco. Satellite imagery is a widely available commodity. How is NGA managing the deluge of data and changing how it acquires products? I think the challenge going forward is less about the imagery and more about the applications. That is not to say that imagery is not important. You have to have the original source. We transitioned imagery procurement to the National Reconnaissance Office. [NRO Director] Betty Sapp and I agreed to clean up the lanes: she’s in the image acquisition sourcing business. I’m in the geospatial intelligence business. The challenge now is not how we’ll get the image — some will be commercial, some will be governmental — the bigger challenge is how do we get the information off the image in a timeline that serves users. What we’re emphasizing at NGA are algorithms, apps, computer science, data science, change detection, computer vision. That has resulted in a surge in hiring in the scientific field and in the creation of new relationships with industry. The profession has been commoditized so there’s a great, vibrant industry out there doing cool things with imagery. I want to make sure we take advantage of those opportunities. Are commercial and open source intelligence meeting government needs? When I started in this business more than 35 years ago, it was a government owned, government operated monopoly. We owned everything. We classified everything. It was a small world, very closed. [In 2010] NGA signed the EnhancedView contract [with DigitalGlobe] for commercial imagery. When I arrived here in 2014 we were midway through EnhancedView. I thought the agency was still holding back. It’s not meant as criticism. Our approach to nongovernmental sources was inhibiting us more than it should have. My challenge to the agency was how can we succeed in the future in the open and with the open? How is that transition going? We broadly accepted the challenge. The agency has made a number of engagements that four years ago we would have called nontraditional and are now commonplace. As far as our tolerance for risk, we’re better at it. As we continue to engage with the open, we just need to do it very carefully. EnhancedView transitioned to the NRO in August 2018. Subsequent to that move, NRO made the decision to add three years to the contract. That was the result of a market survey. The government decided that there was no other company that could provide the imagery quantity and resolution we need. Are newer commercial companies like Planet gaining ground as NGA suppliers? We’re in a our third contract with Planet [Planet’s small satellites image the entire land mass of the Earth every day]. What Planet provides is different than what we get from DigitalGlobe. With Planet, it’s been more of an automation play. How can we use software apps and algorithms? We estimated we would have to hire six million analysts to exploit all the imagery we’re getting. With Planet, because of the temporal nature of the data, versus the spatial nature of EnhancedView, we’ve been learning new things about what we can discover. There aren’t many companies in the U.S. that can provide the reliability and performance we need. A number are on the cusp of doing so, for example BlackSky and other startups. Betty Sapp and I almost a year ago put together a commercial geoint staff that evaluates new imagery and services. We were so pleased that it became part of the organization. What are other projects to watch at NGA? A construction contract will be awarded in March for NGA’s new campus in St. Louis, Missouri. We are going through source selection. It was a government decision to recapitalize a 100 year old infrastructure where we have 3,150 employees. It’s almost 100 acres. Is there a particular reason why your replacement is a military officer and not a civilian? What are your plans after retiring from federal service on February 7? I’m not sure what I will do. I’d like to stay around the profession, it’s kind of all I know.